Contact information can be found on our researchers' individual webpages. 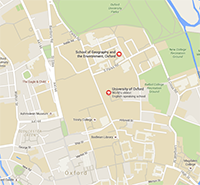 The TSU does not offer an independent graduate programme but senior TSU academics are able to supervise students who are admitted to the Doctor of Philosophy (DPhil) programme at the School of Geography and the Environment or other DPhil programmes around the University. Prospective graduate students should apply through the School of Geography and the Environment's International Graduate School in the first instance. Sign up to receive the TSU newsletter and keep up to date with new TSU projects, activities, events and other news.